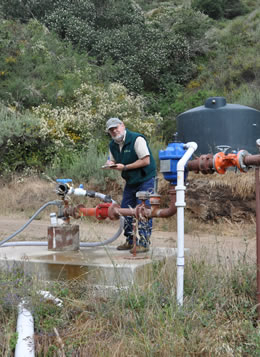 An irrigation efficiency evaluation helps determine the volume, frequency, and application rate of irrigation water in a planned, efficient manner. Its purpose is to address proper irrigation scheduling, in both timing and amount, the control of runoff, and the uniform application of water. 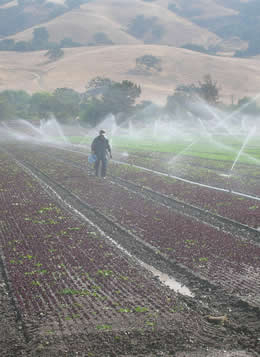 Irrigation efficiency can help manage soil moisture to promote desired crop response, optimize use of available water, minimize irrigation-induced soil erosion, decrease nonpoint source pollution of surface and groundwater resources, manage salts in the crop root zone and manage the air, soil or plants. Our staff expertise includes Agricultural Engineering, Agronomy and Soil Science with Certified Crop Advisor (CCA) credentials. 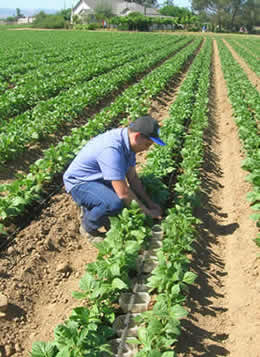 Contact Laura Murphy, RCD Soil Scientist, for more information about Irrigation Efficiency Evaluations. The RCD also offers Irrigation Efficiency Trainings, offered in both English and Spanish, to help irrigators learn how to be more water efficient.